Birthplace : North Andover, Massachusetts, U.S.
Zachary Robert "Zak" DeOssie is an American football linebacker for the New York Giants of the National Football League. He was drafted by the Giants in the fourth round of the 2007 NFL Draft. He played college football at Brown. 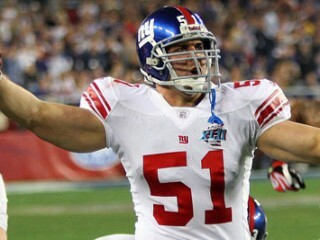 A Pro Bowl selection in 2008, DeOssie earned a Super Bowl ring with the Giants in Super Bowl XLII. He is the son of former NFL linebacker Steve DeOssie. The two hold the distinction of being the only father-son duo to win Super Bowls with the same franchise. * Originally a 4th round (116th pick overall) draft choice by the Giants in 2007. * Zak's father Steve DeOssie was a linebacker and deep snapper with the Dallas Cowboys, New York Giants, New York Jets and New England Patriots…Steve DeOssie played in 175 games in 12 NFL seasons, including more than 4 years with the Giants (1989-93). He delivered the snap for Matt Bahr's 42-yard field goal as time expired that gave the Giants a victory over the San Francisco 49ers in the 1990 NFC Championship Game. A week later, DeOssie started at left inside linebacker in the Giants' Super Bowl XXV victory over the Buffalo Bills. * Named to the 2008 NFC Pro Bowl team as the "need" player and served as the snapper for his teammates, punter Jeff Feagles and placekicker John Carney. * DeOssie is 1 of 2 Giants from the Ivy League. The other is offensive lineman Kevin Boothe, who played at Cornell. * Has played in all 48 regular season and 5 postseason games in his career as the long snapper and on coverage teams…Has 27 career regular special teams tackles and 7 postseason special teams tackles. * In 2009, played in all 16 games as the snapper on punts and placekicks. After 2 seasons as the punt snapper, DeOssie added snapping duties on placekicks in the preseason after Jay Alford suffered a season-ending knee injury…Had eight special teams tackles (6 solo). * In 2008, played in all 16 games and the NFC Divisional Playoff Game vs. Philadelphia…Served as the long snapper and finished 3rd on the team in special team tackles with 13…Also had 1 special teams tackle in the NFC Divisional Playoff Game…Named to the NFC Pro Bowl team as the "need" player. Snapped for punts and placekicks and contributed 1 special teams tackle. * As a rookie in 2007, played in all 20 regular season and postseason games as the punt snapper and on other special teams…Finished with 6 special teams tackles in the regular season and led the team with 6 in the postseason. * Made 1st career special teams tackle at Atlanta (10/15). * Had 2 special teams tackles in both the NFC Wild Card Game at Tampa Bay (1/6) and the NFC Divisional Playoff at Dallas (1/13)…Had 1 special teams tackle in NFC Championship Game at Green Bay (1/20) and in Super Bowl XLII vs. New England (2/3)….After the Giants took the lead with 35 seconds remaining, DeOssie tackled Laurence Maroney on the kickoff, forcing the Patriots to begin their final possession at their own 26-yard line. * Played in 36 games with 29 starts at Brown and recorded 315 tackles (187 solo) with 10.5 sacks for minus 59 yards, 36.5 stops for losses of 126 yards and 5 quarterback pressures. DeOssie forced 5 fumbles, deflected 11 passes and blocked 1 kick. He had 4 interceptions for 60 yards in returns. * Was a 2-time finalist for the Buck Buchanan Award, given to the nation's top defensive player in Division 1-AA…DeOssie became only the 3rd player in school history to lead the team in tackles 3 times (98 in 2004, 80 in 2005, 110 in 2006)…His 110 tackles in 2006 rank 8th on the school's season-record list…Was only the 13th player in Brown annals to record over 100 tackles in a season. * As a senior in 2006, was an All-America 1st-team selection by The NFL Draft Report, earning 3rd-team honors from the Associated Press…A 1st-team All-Ivy League, All-New England and ECAC All-Star pick…Ranked 8th in the nation with 11.4 tackles per game…Started all 10 games at strongside inside linebacker and led the Bears with a career-high 110 tackles including 68 solo stops, 2nd best in the nation. * Participated in the Shaun O'Hara Foundation Golf Outing, raising money for cystic fibrosis research. * Participated in the Giants Foundation 2009 Golf Outing. * Attended the Champions for Children fundraiser gala benefitting the Tom Coughlin Jay Fund Foundation. * Attended the Muscular Dystrophy Association's Muscle Team fundraiser dinner. * Attended the annual dinner benefit for My Sister's Place - a Giants supported domestic violence shelter in Westchester, N.Y. - and received an award on behalf of the team for the support of the organization. * Hosted members of the Jr. Giants Kids Club at the Timex Performance Center for football activities, food and autographs. * Attended a fundraiser dinner hosted by Coach Peter Giunta for Holy Spirit School. * Attended the Giants Kickoff Luncheon benefitting St. Vincent's Medical Center. * Public policy major, with a minor in business…Son of Dianna and Steve DeOssie…Steve and Zak DeOssie are the 4th father-son combination in Giants history. Born Zachary Robert DeOssie on May 24, 1984.